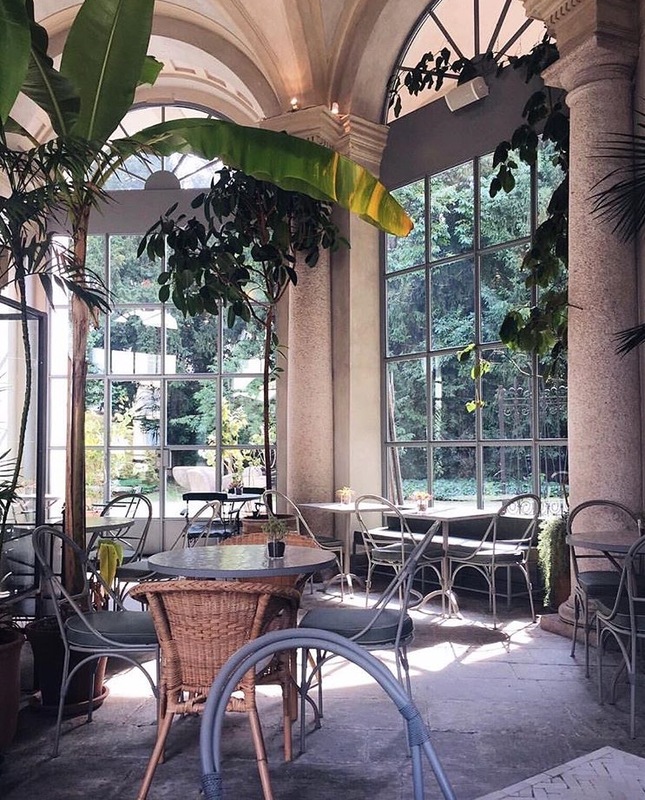 I’m not sure if this is a worldwide trend, or just a Milan trend but ridiculously beautiful and interesting museum cafes are officially a thing. Here is a list of some of the unique places where you can sit down and have an expresso or maybe even a plate of pasta during your next museum visit. Actually even if you skip the museum and just head to the café, these spaces have been strategically placed so museum entrance is not obligatory. There’s something to be said about sipping on a cup of tea while staring at an enormous original piece of seventeenth century art (St. Bernard Converting the Duke of Aquitania by Pietro Damini's). This striking space was designed by RGA studio, and features an intense petrol blue walls and restored peach marble floors. The cafe is the namesake for Fernanda Wittgens, the visionary gallery director who was responsible for reopening the museum after the World War II bombings. The end result is just impressive. The espresso here was also really good. I didn’t try the food items, so if you do, let me know about it in the comments box below. If you’ve follow me on Instagram you’ve probably seen me post pictures of this space a few times. The Caffe Letterrio is right off of the Duomo square, but for some reason no one seems to know about it. But lets call that a good thing, it means you won’t have to worry about dealing with the crowds. You can visit for lunch, “aperitivo”, coffee and a tea (FYI - they carry one of my favorite tea houses Mariages Freres). If you follow anyone who is anyone on the social media world for Milan you would have seen a post about Lùbar. The place is pretty darn pretty, with its large windows, massive columns and central ferns that accentuate the space. Decorated in natural tones of white, beige and green the space is reminiscent of a Sicilian winter garden. Plus it has great views of the eighteen century Villa Belgiojoso which houses the Galleria d’Are Moderna. If you’re going on a weekend, expect long lines waiting for a table. But you may get lucky if you go during the week. Or since you read my blog you know that you can book a table online directly from their website. You can find Prada’s modern art museum on the outskirts of the city in what used to be a distillery. The museum’s signature bar, Bar Luce, was designed by the American film director Wes Anderson. In fact the end result is a little kitch. The cafe looks more like a set of Milanese bar than an actual Milanese bar. It’s modern with an obviously fake hint to the past. While certainly odd and a little off-putting, there is something intriguing and endearing about the space. Which definitely means you should check it out. While there I had a heavy (I’m still breastfeeding) midday snack that was quite good. Just expect USA (not Italian prices) and a very American mandatory service charge. But hey, its Prada. Don’t ask me how many times I walked in front of this building without realizing it was a museum. I have to thank the talented and knowledgeable Giacomo, who does my private guides around Milan for finally getting me to step inside this space. It was definitely worth while since VOCE’s café and restaurant is run by the “Aimo and Nadia” team, the powerhouse behind one of Milan’s most acclaimed (two) Michelin starred restaurant.